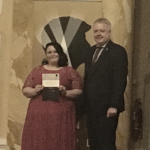 We are delighted to announce that one of our amazing volunteers, Sophie from Cwmbran, was presented with a Diana Award at the Inspire Wales award ceremony in Cardiff City Hall yesterday for her outstanding contribution to our Mind Matters project. The Diana Award is given out in Diana, Princess of Wales’ name to young role models who are selflessly transforming the lives of others. It recognises young people going above and beyond in their daily lives to create and sustain positive change, and through her dedication and commitment Sophie has done just that. Sharing her personal story has encouraged others to become involved and raise awareness of mental health and wellbeing to their peers. Sophie has assisted in the design and delivery of peer-led workshops within youth settings and has also overcome her own challenges around anxiety and depression. What better time to celebrate Sophie’s achievements than during #iwill Week 2017. The week marks the fourth anniversary of the campaign and is all about shining a light on the impact that young people are having, as well as the great work of the 700+ #iwill partners who’ve pledged to create more social action opportunities. Our pledge is to enable even more young people to make a difference to their lives and communities through volunteering and we hope that Sophie’s story will inspire other young people to volunteer. To find out which opportunities are available in your area take a look at our opportunity finder.